When it's completed, the New Tokyo Tower will be the world's tallest structure, surpassing even Canada's CN Tower. Whoever owns the souvenir concession at the old Tokyo Tower must be less than pleased with this news. 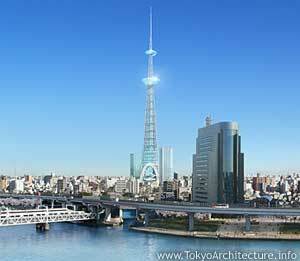 Artist's conception of what the new Tokyo Tower will look like upon completion in 2010 or 2011. Katsusuke Yanagisawa, a 71-year-old retired schoolteacher from Japan, has set the new world's record for oldest man to climb Mt. Everest. And he's got the pictures to prove it. Western donut chains setting up shop in Japan and other Asian countries have to make some changes to their bill of fare to accommodate local tastes, such as using less sugar in their mix and adding flavors such as honeydew melon and green tea donuts to their lineup. Another future victim of KKDA (Krispy Kreme donut addiction). In the video below, British chef Luci Lock demonstrates her simple and elegent recipe for green tea soda. But I just have to make a couple of comments about Ms. Lock's recipe. First of all, when brewing green tea the water you use most definitely does not need to be just-boiled. That may be true for English tea, but water that's too hot will "cook" green tea and spoil the flavor. A water temperature of about 85 degrees celcius, or 185 degrees Fahrenheit, is about right. My second comment is ... tea bags? Tea bags? Let's just say this shows how much work there still is for me to do out there. Still, this home-made green tea soda is a healthy, satisfying alternative to the high-fructose corn syrupy concoctions you'll find in your friendly neighborhood grocery store. I previously wrote about a study showing that green tea may help fight bladder cancer. While we're on the subject of bladders, another study shows that green tea catechins also protect the bladder from inflammation. This opens the door to using green tea as a treatment for inflammatory bladder diseases, which affect millions of Americans each year. The two catechins in which this anti-inflammatory effect was observed were epigallocatechin gallate (EGCG) and epicatechin gallate (ECG). Of these, EGCG is found only in green tea. It looks so welcoming... I think I'll brew up a cup right now! Tokyo University has an online exhibit of photographs from Japan's late Edo and early Meiji periods. In this time of transition, in the late 1800s and early 1900s, Japan threw off the yoke of the shogunate and installed a modern-style government. "You talkin' to me? You talkin' to me?" 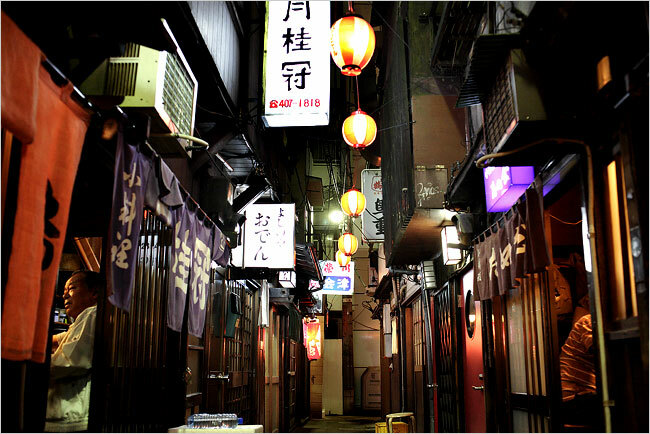 "Nonjatta" (literally "I drank it all") is a blog about the world of Japanese whiskey. Japan, incidentally, is the world's second-largest producer of single-malt whiskey. 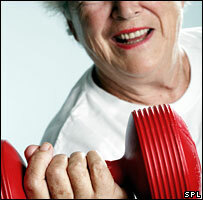 In people over 65, regular resistance training appears to reverse signs of aging in muscles. "[Y]ou don't have to spend your life pumping iron in a gym to reap benefits." It's never too late to start exercising. Age is no longer an excuse not to start. Therapists at California State University and Virginia Tech University say that the key to a happy relationship could be accepting that some miserable times are unavoidable. What they mean is that resigning yourself to some bad along with the good is better than striving for perfection, which does make sense—although the late-night comedians will still have a field day with this news story. With Mellow Monk, you can come pretty close to perfection in green tea. But seriously, folks, the same philosophy that's behind what these therapists are talking about also applies when brewing tea: You don't need to get overly fussy about water temperature or the amount of tea leaves you use. Tea time is supposed to be a time for relaxation. Instead of striving for perfection, think of every cup of tea you brew as a learning experience. Brewing green tea is an art, not a science, and the goal is to strive for what you think is the perfect cup of tea, not what someone else says is perfect. "If misery is the key to happiness, then I must be the happiest woman in the world. Right, Ralph?" The Edo Tokyo Museum features exhibits from old Tokyo, or "Edo," as the city was known in the days of the samurai. There are also exhibits of what life was like in Tokyo in the early 1900s. Sure, the kids will be bored to tears, so promise to reward their patience with something sugary afterwards, and enjoy taking in the (relatively) humble beginnings of what is now one of the world's largest and most dynamic cities. A museum like this is also a nice, quiet interlude after all that modern dynamism has drained your batteries. A scale model of Edo's Ryogoku bridge. The open areas at the ends of the bridge were originally intended as a firebreak but made the bridge "one of the most popular spots in the city, where numerous spectacle houses and street performances could be viewed." The Brooklyn Museum is exhibiting Utagawa Hiroshige's One Hundred Famous Views of Edo, a collection of woodblock-print scenes of mid-nineteenth-century Toyko. But even if you can't make it over to Brooklyn, you can still view the prints online. 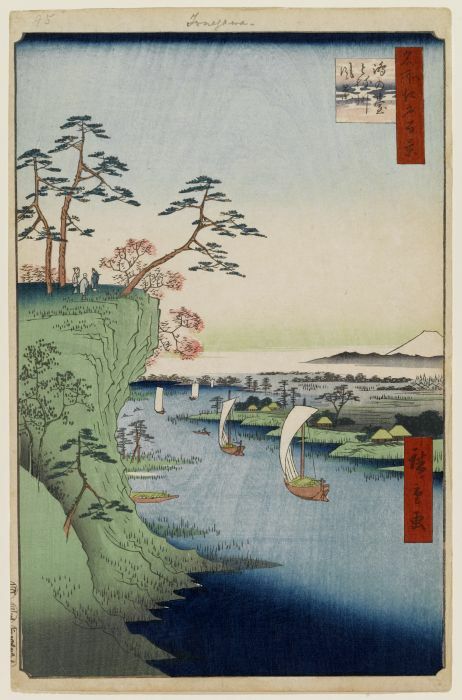 "One Hundred Famous Views of Edo" is actually comprised of 118 views, but who's counting? Found on YouTube—an excellent shamisen-and-taiko piece called Denkou, which means "lightning." It starts slow but quickly builds up to a crescendo worthy of the title. To avoid jerky, stop-and-go playback, click "Pause" right after you start playing. Wait for the video to load at least halfway or so, then click "Play" again.